Tony Martin's charge won at this meeting last year in the Fine Equinity Handicap over two miles and he was prepared perfectly for the Knavesmire once again by his wily handler, who also trained the third home, Quick Jack. Always travelling noticeably well in the hands of his 5lb claimer, Heartbreak City scooted home to win easily, by four lengths, from the running-on Shrewd. The aforementioned Quick Jack was third with Battersea fourth. In victory, Heartbreak City the first horse since the great Sea Pigeon in 1979 to carry more than 9st 4lb to victory in the famous race. Among those sharing the joy of the chaotic post-race celebrations were punters who had attended the Sky Bet Ebor preview evening, at which Richard Fahey had revealed to those present that Martin had requested the use of his apprentice "because he'll win". York racecourse managing director William Derby looked on aghast as connections of the winner threw each other around the winner's enclosure in the aftermath of the race - but it was actually the fact that a marquee adjacent to the parade ring was being prevented from taking off into the sky by the presence of four hefty security guards that was taking his attention. 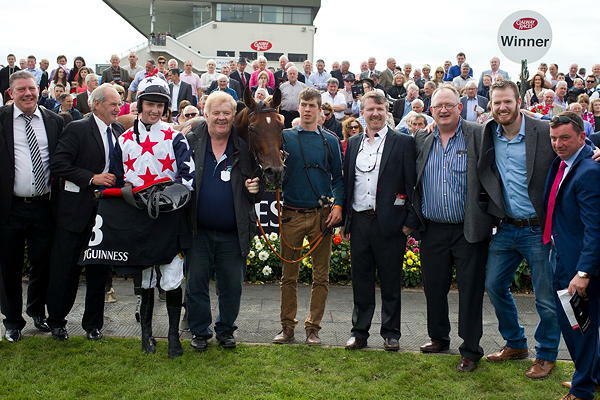 And as a sudden howling wind blew around the racecourse, there was pure pandemonium in one corner as winning owner Aidan Shiels, a publican in New York, celebrated with friends and family, his nose bleeding and his tie at right angles to his collar. Martin, hoarse from shouting the winner home, said: "The young man on him was sheer brilliance. Two down, Lester Piggott wouldn't have been as good. It was a brilliant performance by the lad. "I was just thinking 'Take a pull, take a pull, take a pull'. "I spoke to Richard Fahey (McNamara's boss) and he was so good. We have to give a lot of credit to Richard Fahey. "Poor Quick Jack was slow coming out of the stalls, so credit to Oisin (Orr). He gave him a lovely ride. Two great horses and two lovely rides." Victory here and at Galway have brought a quiet spell to an end for Martin, who suffered at the blow at the end of the jumps season when leading owners Gigginstown removed their National Hunt team. "I understood their decision," he said. "We'd had a bad run with injuries and sickness and they want results. It has been a bit of a tough time. "I'm delighted for the owners of this horse though, who had Benefficient with me, when he won at Cheltenham a few years back. They're great people and it's a pleasure to train for them. "This horse was owned by a grand fella called George Swan who sadly passed away last year and I asked these lads if they would like to take him on, as they were friends with George. "He won here last year and it was after that we thought we'd aim him at coming back here to win the Ebor. Why wouldn't you go for it when it carries the prize money that it does? You'd need to win about 100 0-70s to win this kind of pot." McNamara admitted to trying to "play it cool" before the race but admitted he'd been feeling the tension going to post. "Tony actually said to me 'If he gets some cover and a good ride, he'll win'," he said. "When I turned in I was tracking Seamour and when I got to the two-furlong pole I knew I was going to win. "He travelled there brilliantly, I was scared to look around - I was looking up at the big screen but they weren't showing the race so I panicked a little bit then. When I crossed the line it was such a relief. "If I could tell you one race I wanted to win, this is it. After coming here with my family for the last three years. I was with Johnny Murtagh when Mutual Regard won it - it means so much to me, I can't explain it." In a fast-run race it was stayers who came to the fore and little suprise, perhaps, that connections of all of the first three were left looking at Newmarket's Cesarewitch as a possible next target. Runner-up Shrewd's trainer Iain Jardine said: "He's stayed on well from a long way back. "Clifford (Lee) was under instructions to watch all his old races and when he won here earlier in the season that is what he did so I can't blame him. "We've nicked second and picked up lots of prize-money and the owners had a good bit on each-way too. "We were unlucky with Nakeeta earlier in the week and have also been second in the Chester Cup - we're getting closer to landing a big one. "This lad is in the Cesarewitch, as is Nakeeta. It's great to be involved in these big races, but disappointing when you are second in them."